When it comes to driving in tough road conditions, nothing does it better than all-wheel drive and 4-wheel drive vehicles. But while these terms are often used interchangeably, these two driving configurations have major differences. An all-wheel drive (AWD) vehicle is equipped with a powertrain that distributes torque and power to all four wheels of the vehicle. Ideal even for snowy or icy road conditions, all-wheel drive offers great traction and road grip. Meanwhile, a 4-wheel drive (4WD) vehicle, also known as 4×4, is a drivetrain configuration that can either distribute torque to 2 wheels or all 4 wheels of the vehicle. It is available in full-time, on-demand, and automatic versions, and it is most ideal for extreme off-road driving conditions. Even though they are both capable of generating a higher amount of torque and traction, there is still a big difference between all-wheel drive (AWD) and 4-wheel drive (4WD). 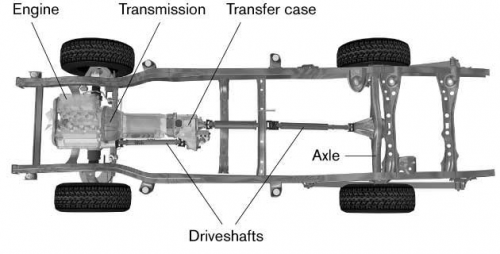 An AWD drivetrain configuration employs a rear, a front, and a center differential to distribute power and torque to all 4 wheels of the vehicle, while 4WD is equipped with two differentials and a transfer case. The main difference between AWD and 4WD lies in their working mechanism. In AWD, power is transmitted to the wheels that require the most traction. It is designed with a center differential, which allows the wheels to rotate at different speeds. Advanced AWD units have a built-in Engine Control Unit (ECU) that interprets and determines the wheels that require the most traction before torque is distributed between the front and rear axles. Four-wheel drive, on the other hand, works by transmitting power from the engine to the transfer case. The power is divided between the front and rear axles so the torque is equally distributed to the four wheels. While older versions of the 4WD require drivers to manually toggle a lever to switch from 2WD to 4WD, modern 4WD units are designed with switches that enable drivers to easily change the vehicle’s driving configuration. AWD and 4WD distribute power differently. While the former sends out power to all 4 wheels regardless of road conditions, the latter distributes power to either 2 or 4 wheels. Under normal road conditions, the front wheels of a 4WD vehicle rotates freely while the rear wheels drive the vehicle forward. When driving on unpaved roads, the driving configuration can be switched into the 4WD mode, making it easier to gain more torque and traction. Between the two, the 4WD driving configuration offers better fuel efficiency since power is not permanently distributed to all 4 wheels. Because of its flexibility, the 4WD system is capable of offering drivers more control and maneuverability, making it an ideal vehicle for extreme off-road conditions that may include deep mud, rocky hills or snowy terrains. Unlike 4WD, AWD is not suited for rocky or hilly roads since it was designed to optimize traction on slick or icy roads.